In a previous Westside Story, I included a photo that looks somewhat like the one below. The picture below is actually a cropped version of the original to provide a closeup of my facial expression. 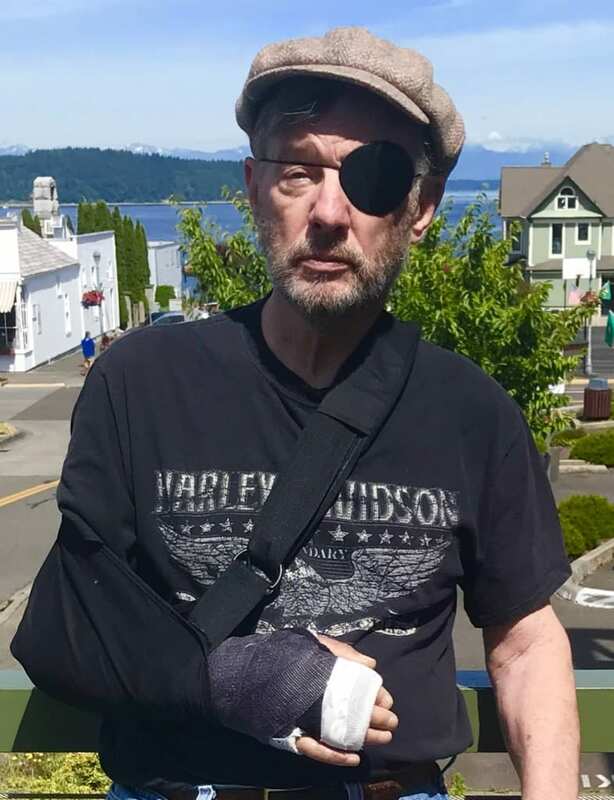 I received several comments from concerned readers because I have such a severe and melancholy or perhaps what could be described as a painful look on my face. 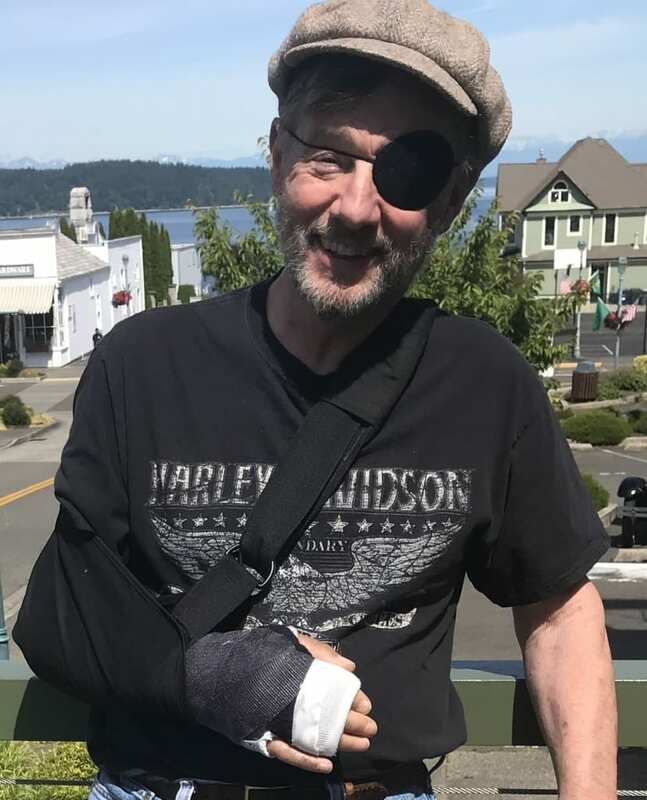 While I am willing to apologize for such a grim look, it is easy to understand my dour appearance once you know I fell off a motorcycle at 70 mph. As time has passed, I have gotten better and back to being closer to my usual self. You’ll note in the second photo, taken only 20 minutes after the first, I have a pleasant smile and more of a happy, joyful look. Do you wonder why? A careful study of my surroundings in the photo should inform you I’m on the deck at Topside Coffee Cabin known by hipsters everywhere as TCC. So here is a hint for all my kind readers. If you are ever in a situation where you are hurtled off a motorcycle at 70 mph, do yourself a favor by getting yourself a tasty adult espresso beverage, and a bakery treat at TCC. TCC espresso and bakery goods can turn a frown into a smile, and with that, your medical condition will improve at a miracle rate. In fact, the next time you see the owners of TCC, John & Niki O’Reilly, feel free to call them Dr. John and Nurse Niki. If you are feeling bad, TCC will make you feel good. Think of the expense for your espresso and pastry as a co-pay. I can’t think of another person who would find joy so soon after having been almost dead near Deadwood than the irrepressible, indominable, irreplaceable Mr. Boyle. Thanks for your kind words. Actually I was 3,335 miles from Deadwood, South Dakota. I have always been very much alive in Deadwood. It is Deadhorse, Alaska where I had my trouble. I get the two deads mixed up too. I am just happy I did not provide a 3rd dead. Dear Joseph, it’s not just the espresso and pastry, but your hard work ,and Kjeri’s too, at working your rehab. So glad to see you with a smile and looking so much better! We’ll be happy to buy you a coffee when we next can get together. Free coffee! Yikes, it is great to have a friend.